Sgt. 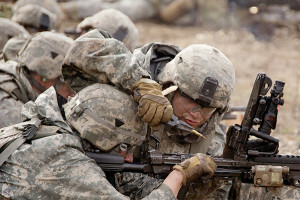 Raul Morales removes a jammed round from an M-249 Squad Automatic Weapon during a 6th Brigade Engineer Battalion, 4th Infantry Brigade Combat Team (Airborne), 25th Infantry Division live-fire assault as part of Oak Edge, May 10, 2017, in the Donnelly Training Area near Fort Greely, Alaska. The 4/25 was one unit the Army had slated for closure. But now, thanks to an Army end-strength increase, the unit will not be closing. The 4/25th is instead back to near full strength, and is preparing to deploy this fall. The 4th Infantry Brigade Combat Team, part of the 25th Infantry Division in Alaska, was all but shut down before recently receiving a reprieve. End strength increases for the regular Army, spelled out in the 2017 National Defense Authorization Act — to the tune of about 16,000 active-duty Soldiers — means the 4/25th can stay open. Mennes explained that the recent end-strength increase for the Army is right in line with Chief of Staff of the Army Gen. Mark A. Milley’s No. 1 priority of readiness. The Army is hiring to fill positions, and will provide more recruiters to meet its goals. Those SFABs — the first of which launched earlier this month — are meant to conduct, advise and assist missions exclusively overseas. Soldiers in those units will be provided foreign language training, as well as training in the use of foreign weapons. SFAB Soldiers will also attend a recently established six-week Military Advisor Training Academy at Fort Benning, Ga.
Mennes said the force structure update will also include a 10,000-Soldier readiness enhancement account, which will allow units to deploy fully manned — even when some of their Soldiers need to go off to professional military education schools, or are unable to deploy for medical reasons. The readiness enhancement account will provide flexibility to the Army’s Human Resources Command to ensure units are fully manned before they deploy, Mennes said. The plus-up of Soldiers in the active force overall is “encouraging” for the Army, Mennes said. The general also said the Army could always use more Soldiers — and remains hopeful the Army will get them.